A new study out of China has remarkable findings in regards to lung cancer prevention. Lung cancer was responsible for the deaths of 158,081 people in the U.S. in 2009, according to the Centers for Disease Control and Prevention. Prevention, above treatment, is crucial as more people die from this type of cancer in the U.S. than any other type. The latest research indicates something as simple and readily available as garlic could play a big role in reducing our risk for developing the deadly disease. According to the study published in Cancer Prevention Research, people who consume raw garlic as a regular part of their diet were 44% less likely to suffer from lung cancer. The research relied on data from 1,424 lung cancer patients and 4,500 healthy adults. Researchers with the Jiangsu Provincial Center for Disease Control surveyed the participants on their diet and lifestyle habits, including garlic consumption and whether or not they were smokers—a known-contributor to lung cancer risk. While raw garlic consumption at least twice weekly was associated with a whopping 44% reduced risk of lung cancer, that wasn’t even the most remarkable news from their study: Even among those who smoked, the garlic consumption reduced lung cancer risk by 30%. 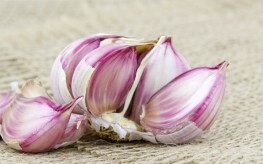 It’s believed the component known as allicin is related to garlic’s anti-cancer benefits. According to the Daily Mail, allicin calms inflammation in the body while acting as an antioxidant and reduces damage to the cells by free-radicals. Not surprisingly, this active compound is just one notable reason for garlic’s many health benefits. While raw garlic may not sound appetizing to many, it can be sliced thinly and added to various salads and dishes without an overpowering flavor. You can also use raw garlic in dishes you would normally add cooked garlic, simply adding the garlic right before serving. OK, here’s to raw garlic! Cut up a clove into 6 pill sized pieces, then washed them down one at a time with my thyme tea. They weren’t that bad. I have been having some respiratory problems as of late, and this is one cheap and easy remedy. I can buy great organic raw garlic for less than a dollar a clove, and one clove will last at least a week. This along with my thyme and ACV tea is already making me feel better. Love these kinds of articles!